Stays on surfaces like leather for up to 6 months and should therefore be used after any other cleaners. The active ingredient is approved by the FDA and BgVV (German Institute for Consumer Health Protection & Veterinary Medicine), to inhibit and prevent the growth of bacteria, fungi and algae. It is registered under the EU Biocide Directive and is formulated using nano-technology and a natural antimicrobial agent. It destroys over 99.9% of bacteria within 24 hours. It is currently used in the NHS to eradicate and prevent further spread of MRSA. Race Glaze Anti-Bacterial Cleaner & Protectant is solvent free and contains no chemicals which could cause skin irritation. It uses a natural and sustainable raw material and does not contain DMF. A unique product for the car care market. 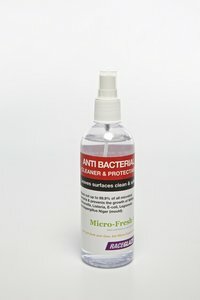 Eliminates and prevents bacterial growth at the microscopic level - kills MRSA, salmonella, listeria, E-coli, (food poisoning), legionella (bacteria causing legionnaires disease) and aspergillus niger (mould). Its already in use in the NHS and kills 99.9% of bacteria within 24 hours. When applied to products and surfaces, the active ingredients cause the functions of bacteria to break down, resulting in the prevention of bacterial growth. For any valeters who want to offer an extra clean service or protect themselves, people hiring cars, people with children or pets, people buying any second hand goods - many many uses. 500ml trigger spray bottle - note that the 250ml bottle is illustrated. "I just wanted to say thanks for the ultra quick delivery. It's just arrived and I really cant wait to get waxing!"